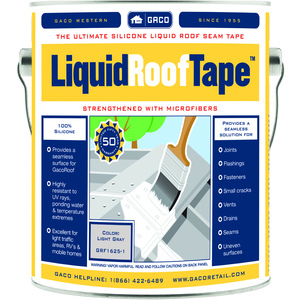 Gaco LiquidRoofTape | Silicon Liquid Roof Seam Tape | Gaco Retail Coatings | Duval Paint & Decorating, Inc.
Gaco Liquid Roof Tape features innovative roof tape technology. Makes taping joints seamless. Made with 100% silicone to withstand the elements. Provides exceptional coverage and is suitable for light foot traffic. LiquidRoof Tape is a thick, rubber-like comprised of 100% silicone and micofibers. 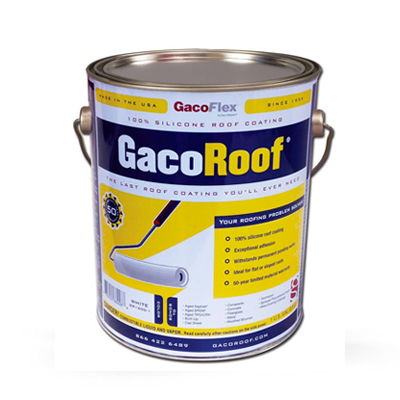 The unique properties allow it to replace traditional rubber and mesh seam tapes when used in conjunction with GacoRoof 100% Silicone Roof Coating. *Not recommended for application over 3-Tab mineral faced asphalt shingles, or over asphalt coatings. An asphalt coating is different from aged asphalt. Aged asphalt refers to Built-Up Roofing (BUR), made up asphalt felts mopped to the roof substrate with hot liquid asphalt. Some volatile oils will be on the surface and with time disappear, i.e. ; aged. Gaco Liquid Roof Tape coating will adhere to aged Built-Up Roofs. Asphalt coatings include asphalt emulsion, (Water Base), aluminized and cut-back, (Solvent Base). These coatings are usually applied over older BUR roofs. None of these coatings have dependable long term adhesion to BUR and frequently chip or peel off after several years of service. It is the possibility of poor adhesion of these asphalt coatings that make them risky to coat with GacoRoof.